Our Mount Everest expedition team is now open to qualified climbers. Mountain Gurus South Side expedition is led by a team of highly experienced IFMGA/UIAGM certified mountain guides. If you have been training for a world-class climb or are ready to tackle the toughest of the Seven Summits, Mountain Gurus is ready to take you to the roof of the world! Please contact us directly to learn more about our 60-day full service climb. The highest mountain on earth and considered the premier guided climbing challenge, Mount Everest was first summited by Sherpa Tenzing Norgay and Sir Edmond Hillary in 1953. At 29,035 feet Mount Everest is one of the fourteen eight thousand-meter peaks and is known by the Sherpa as Sagarmatha “Head of the Sky”, or the Tibetans as Chomolungma “Mother Goddess of the Universe “. The mountain is approached from the South Side via the infamous Khumbu Icefall, Western CWM and South Col. Mount Everest, while not posing substantial technical climbing difficulty, does require a high level of climbing proficiency on steep and exposed terrain at high altitude. For those that stand on the summit of Mount Everest it is one of the greatest achievements in mountain climbing. 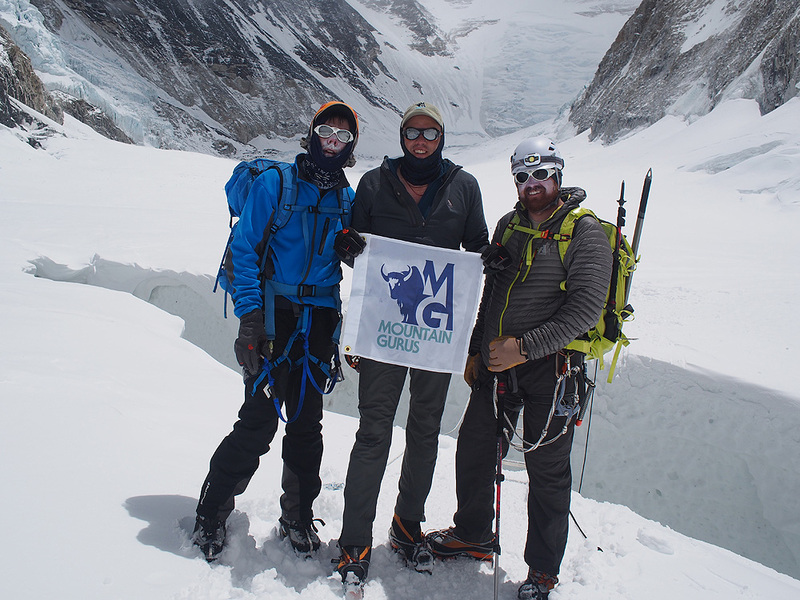 Mountain Gurus proudly offers a fully supported Mount Everest climb. Our team of experienced Sherpa guides will handle all the logistics during the expedition. As IFMGA/UIAGM trained mountain guides, they take great pride in managing our ground operations, working with our team of climbing Sherpa, and expedition staff to ensure safety and success on the mountain. Each of our mountain guides have extensive experience on Mount Everest with multiple summit climbs. Our Southside expedition begins in the historic city of Kathmandu, known for its fascinating Nepalese culture and ancient temples. We fly to Lukla and trek along the Dudh Koshi River until arriving in legendary village of Namche Bazaar, the main trading center of the Sherpa people and gateway to the Khumbu Valley. Over the next week we are rewarded with amazing views of the Himalaya before arriving in Everest Base Camp at 17,700 feet. The climb ascends through the Khumbu Icefall with its seracs and crevasses, using fixed ropes and ladders prepared by our Sherpa climbing team. The classic South Side route climbs to Camp 2 via the Western CWM, then to Camp 3 high on the Lhotse Face, and finally to the wind swept South Col where we place our final Camp 4. Summit day starts early climbing the Southeast Ridge assisted by oxygen to the Balcony at 27,500 feet. We then continue to the South Summit at 28,500 feet. From here we traverse the exposed final ridge for a few hundred feet before reaching the Hillary Step and then to the summit of Mount Everest at 29,035 feet. Why climb Mount Everest with Mountain Gurus? Mountain Gurus offers a fully supported world-class Mount Everest climbing experience. We have a dedicated expedition coordinator in Kathmandu who handles all logistics and ground operations for our Mount Everest climb. Our logistics manager works closely with all our expedition staff and Sherpa guides, all of which have summited Mount Everest multiple times. While in basecamp you will enjoy hot showers, comfortable tented accommodations, and regularly scheduled hot meals provided by our excellent cook in our heated dining tent. Premium group climbing gear, tents, porters, and yak service assure you will be comfortable while enjoying your Mount Everest adventure. What experience do I need to climb Mount Everest? Are you ready for the ultimate adventure? Climbing Mount Everest is not for the faint of heart. This is an expedition that requires two months of your time in Nepal, as well as prior training. It takes more than a few months to develop the climbing experience and skills needed to make this formidable journey. Summiting Mount Everest is a culmination of years of preparation and training, both mental and physical. Before you consider participating in a Mount Everest summit expedition, you should have four to five significant climbing expeditions under your belt. These may include Denali, Aconcagua, Mount Vinson, or other Himalayan peaks such as Cho Oyu, Island Peak. Only seasoned climbers will be accepted for the expedition group so if you are just starting out, please consider taking one of our mountaineering courses or Seven Summits climbs. Peak physical conditioning with advanced technical skills are required to be eligible for this climb. A brief roster of the skills you must have include: extensive high altitude climbing experience, advanced mountaineering and technical skills, crampon techniques, glacier travel, fixed line use, ice axe skills, experience with ice axe self-arrest, crevasse rescue, rope knowledge including knots and anchors, and extreme weather camping. Read our The Four-Legged Stool blog post for a better understanding of what skills are required to climb Mount Everest. If you aspire to climb the heights of Mount Everest and are new to climbing, check out our Northwest climbs and courses to get you started developing the basics. From there, we can recommend incrementally challenging expeditions to set you on a road toward developing the skills you will need to summit Mount Everest with the understanding that this is a journey that takes years to prepare for and months to physically accomplish! What does the Mount Everest climbing expedition include? Summiting Mount Everest is quite literally a walk in Sagarmartha National Park, but it is a rigorous adventure that will challenge your body and mind. The expedition should be considered in two distinct sections – first the trek to Everest Base Camp, and the second is the time we spend at Base Camp and in higher altitudes as we work our way up to the final summit attempt. Journey to Base Camp: Once arriving in the Nepalese capital of Kathmandu, we will hop a twin-engine flight into Lukla where we get our first glimpse of the mountain. We will spend 12 days working our way up to Everest Base Camp at 17,600 feet. Along the way we will enjoy trekking through farming villages, local bazaars, a historic monastery, and a memorable walk across an amazing suspension bridge high above the Milk River. We will cross glacial streams, see herds of yaks, and a memorial to lost climbers as we make our way to the foot of the Khumbu Icefall and Everest Base Camp. 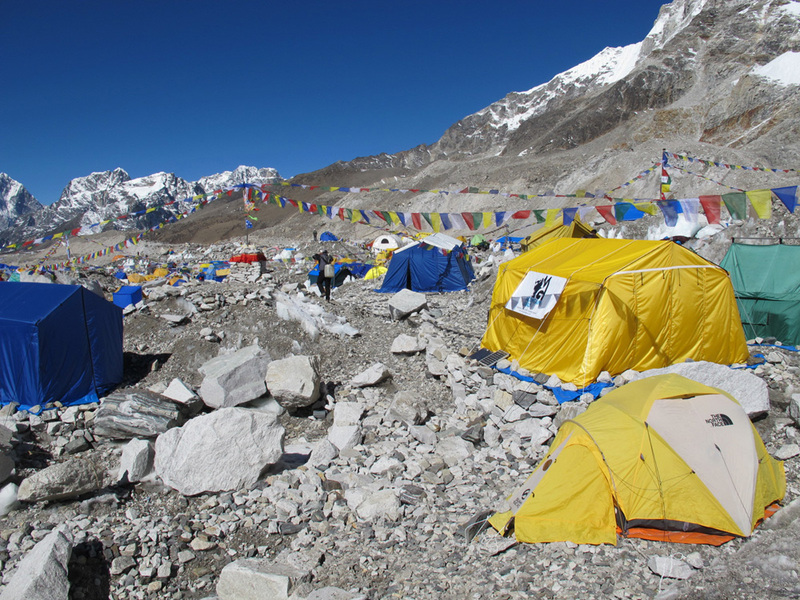 Progressive Camps: At 19,500 feet, we establish Camp 1 a short distance above the Khumbu Icefall. Camp 2 will take us to 21,000 feet along a moraine below the spectacular Southwest face of Everest. At 23,500 feet, we establish Camp 3 on a perch near the south face of Lhotse. A night or two at Camp 3 and then it is back to base camp for a rest, before making our summit push. Summiting Everest: We start our summit attempt at Camp 2, then head up to Camp 3 where we begin sleeping with oxygen to prepare for the rigorous final climb. We will establish Camp 4 on windswept South Col. From there we climb the Southeast Ridge with supplemental oxygen up to the Balcony at 27,500, and then to the South Summit at 28,500 feet. A few hundred feet more and we reach the Hillary Step before continuing to the main summit. After time to appreciate the view at the top of the world and take photos to document your epic achievement, we head back down to Camp 4. For those that succeed, they will have achieved the greatest of the Seven Summits and one of the most challenging climbs on earth. As we descend from the exhaustive climb, we take care to descend at safe intervals with supplemental oxygen to allow time to decompress while minimizing risk of altitude and mountain sickness. What are the risks of an Everest expedition? As with any high altitude adventure, there are risks involved. Some can be mitigated by proper preparation and many will be mitigated by our professional guide staff. Even if you are in top physical condition and have many climbs under your belt, the mountain will dictate the outcome. Altitude sickness is one of the major roadblocks to hitting your goal. One of the best ways to have a successful expedition is to make a wise choice on which guide service you use! What are my responsibilities for the Mount Everest climb? In addition to your program fees, which covers most of your expenses, you will need to arrange your round-trip international airfare to and from Kathmandu. You will also be responsible for any non-scheduled meals, snacks on the climb, personal climbing gear, trip cancellation insurance, any required medical or evacuation coverage/expenses, and gratuities to local staff and Sherpa guides. You are also responsible for your own physical conditioning and training prior to the expedition. Mount Everest is a physical and mental challenge that requires extensive training, prior climbing experience, and glacier skills. This is a highly technical climb so proper preparation is key to seeing you safely through your adventure and achieving the summit. Our Mount Everest itinerary remains flexible. We seek to gain adequate acclimatization managing our exposure on Everest and within the Khumbu icefall. We have the option of climbing Lobuche Peak prior to our climbing rotations. The team also has the option of utilizing helicopter service during the trekking phase of the trip. Arrive at Tribhuvan International Airport, Nepal (KTM). Mountain Gurus representatives will transfer you to the hotel. Our trek begins in the historic city of Kathmandu, known for its fascinating Nepalese culture and ancient temples. The hotel is located near the popular Thamel district jammed with restaurants and shops selling Nepali handicrafts. We climb through the icefall with its seracs and crevasses while using fixed ropes and ladders prepared by our Sherpa climbing team. Camp 1 is located at short distance above the icefall. Camp 2 is located on a moraine below Mount Everest’s spectacular Southwest Face. Camp 3 is perched high on the Lhotse South Face. We sleep at Camp 3 for one or two nights before heading down to Base Camp to rest before our summit attempt. We climb to Camp 2, then to Camp 3 where we begin sleeping on oxygen and finally to the wind swept South Col where we place our final Camp 4. We leave Camp 4 early, climbing the Southeast Ridge with oxygen to the Balcony (27,500 ft). We continue to the South Summit (28,500 ft). From here we traverse the exposed ridge for a few hundred meters before reaching the Hillary Step and then onto the main summit. Once at the top of the world we share in the excitement of our accomplishment. We have enough time for summit photos and then make our way down the mountain and back to Camp 4 at the South Col.
$10,000.00 deposit includes reservation fee, due with application. $10,000.00 due 120 days prior to departure. Mountaineering Boots: Full shank crampon compatible. Heavy weight synthetic/ hybrid mountaineering boots. 8000 meter mountaineering boots are required. Backpack: One 70L pack with good support, adequate to carry personal, and group gear. The pack should fit properly, have a good waist belt, and be able to carry gear between 30-40 lbs. Duffle/zip Bag: Two large size, transporting gear to basecamp via mules. Liner Bags: 4-6 Large plastic contractor bags. As the highest point in the world, this climb requires significant physical, mental, and technical skills. Previous experience at altitude and expedition style climbing is a must. Be prepared to carry 40 lbs. packs at altitude, including supplemental oxygen tank. Experience with ladder crossing, fixed lines, and steep snow / ice climbing are essential to making this trip a safe and enjoyable climb. Here’s a suggested progression of climbs before attempting Mount Everest. What is the Mount Everest climbing permit cost? The Mount Everest climbing permit cost and fixed route fees are included within the cost of the Mountain Gurus program fees. All foreign climbers are required to obtain an $11,000 permit which allows you to climb above Everest Base Camp to the summit of Mount Everest during the spring climbing season. Mountain Gurus will obtain the climbing permit for our expedition once we arrive in Kathmandu. Other fees included within the cost of the expedition are the Icefall Doctors (fixed route fee): $500, Garbage/waste deposit: $500. Most cell phone providers will work in Nepal, check your provider for overseas rates before you leave. Beyond this wifi service is available at Everest Base Camp and along the trekking route ($100-$500 depending on usage). It is often best to purchase an unlocked cell phone and a local Ncell sim card if you intend do a lot of international calling. Cell phone and wifi service is not available above Everest basecamp. Thuraya satellite phone service is more reliable at basecamp and above at higher camps.